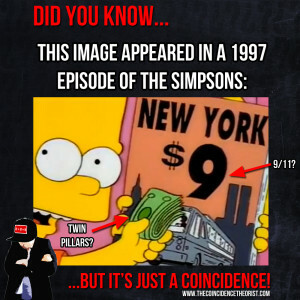 You are here: Home / BLOG / 9/11 / 9/11 “Predicted” In The Simpsons? In a 1997 episode of The Simpsons, ‘The City of New York vs. Homer Simpson’, Lisa Simpson presents a 9$ magazine entitled ‘New York’. “Absolutely nothing unusual about this,” says The Coincidence Theorist. 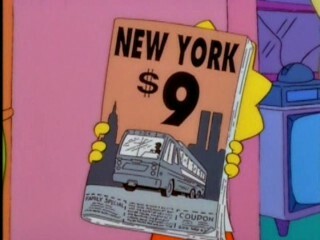 Conspiracy theorists have suggested that the magazine’s peculiar design could’ve been a deliberate allusion to the 9/11 attacks that would take place four years later. In the same scene, Bart Simpson holds up a stack of money in front of the magazine. Some have speculated that these dollar bills also encode unusual twin pillar symbolism. 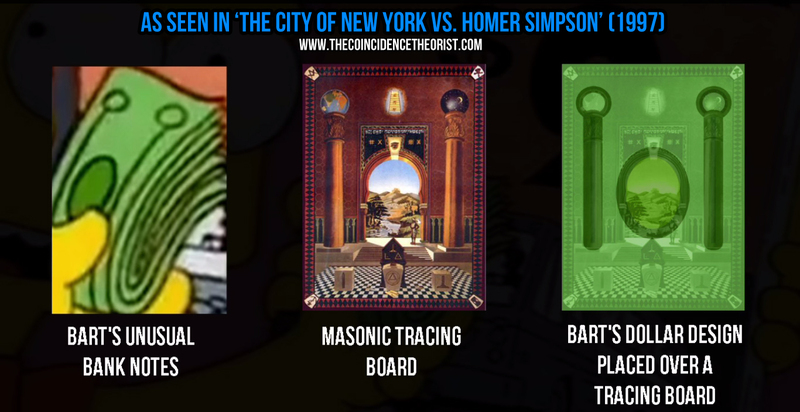 Others have even drawn comparisons between the design of Bart’s dollar bills and the design of a Masonic tracing board. 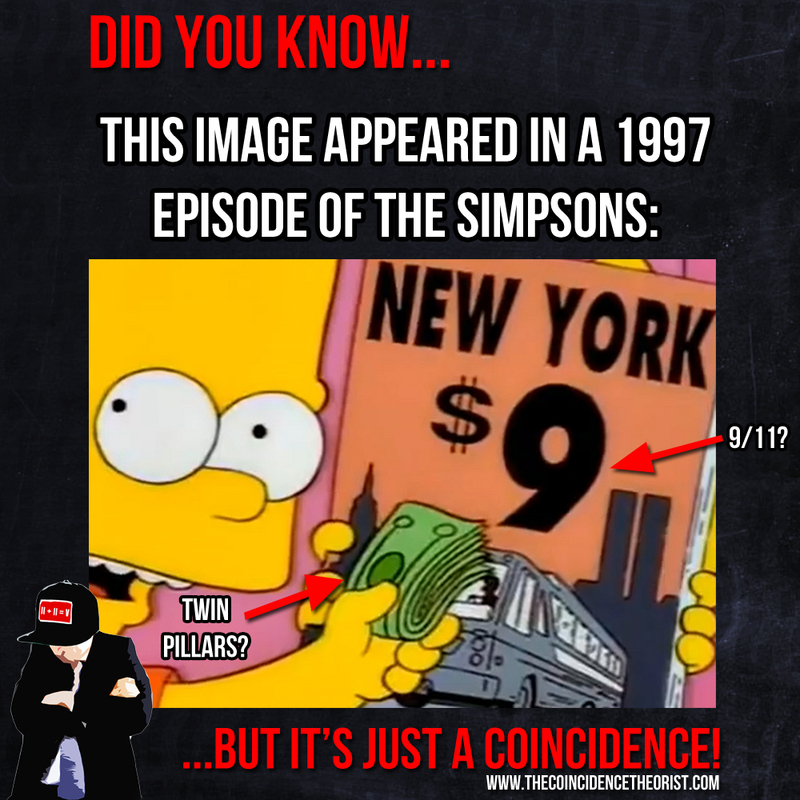 Share this meme with all the coincidence theorists you know! The really odd part is the fact that they chose the $9 bus fare. I live in Michigan which isn’t all that far from New York, and I can’t take a bus from here to New York for $9. 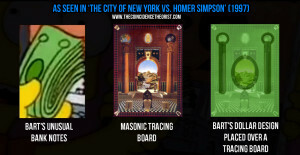 Even if the Simpson’s live REALLY close, they can’t go to New York for such a low price. Interesting… Never thought about the dollar sign representing September before, thanks! is pretty freaky! When I think of New York City, I think of the Empire State Building and Statue of Liberty. It’s odd that they included the Twin Towers instead of the Statue. Even if you let that one pass, charging only $9 for a ticket to New York? I can see $99 – but $9 seems really low, and a very strange number to pick if they were just picking something randomly. I’m no conspiracy nut – but this one has me wondering ….